As Attacks Mount, Israelis Describe Lives Lost And Families Shattered : Parallels Several recent Israeli victims of Palestinian attacks recount the violence and how it is fueling tensions in the long-running conflict. 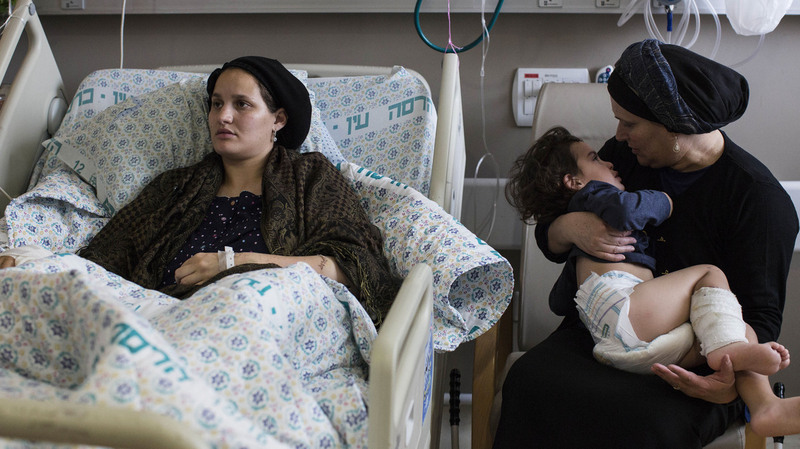 Odel Bennett, a 22-year-old Israeli woman, lies on a hospital bed as her mother Miriam Gal holds Odel's son Natan, 2, at the Hadassah Medical Center in Jerusalem. Bennett was stabbed in an Oct. 3 attack by a Palestinian that killed her husband and lightly wounded her son. On Saturday evening, October 3, Odel Bennett and her husband Aharon walked through a main passageway in the Muslim quarter of Jerusalem's Old City. They had taken their two young children to the Western Wall, the holiest site in Judaism for prayer. Then they were heading to Odel Bennett's parents' home in the Orthodox Jewish neighborhood of Mea Shearim. It wasn't not far, just a few blocks outside the Old City walls. But they didn't make it home that night. A Palestinian man attacked the couple with knives. Odel Bennett was stabbed 17 times, but survived. Her husband and a rabbi who came to help were killed. Bennett is now out of the hospital but still far from healed. The 22-year-old remembers running for help, with a knife still stuck in her shoulder. She said as she ran, she saw many Palestinians. She was looking for someone who would help her. But no one did. "The opposite," she said. "They yelled at me, they spat at me, they cursed me to die." Her husband and the rabbi were among at least nine Israelis who have been killed in a spate of attacks by Palestinians in recent weeks. More than 40 Palestinians have also been killed, some as they carried out the attacks, others in clashes with Israeli security forces. In the long-running conflict, the two sides are trading bitter recriminations and blame for the latest round of bloodshed. Palestinian families of attackers have been shocked and tried to explain the anger, even to themselves. As she recuperates with her children, Bennett looks calm. But she says she has no strength. She says the family is destroyed. She faces months of rehabilitation, and her husband was the sole provider. "The truth is, we are shattered," she said. "And we don't know how to collect all of our pieces." Bennett and her family were the first Israeli victims in the recent knife attacks by Palestinians. Since then, a wave of loss has rippled through many lives. On the eighth floor of Jerusalem's Shaare Zedek Hospital, Menashe Haim breaks away from visiting his mother, just out of intensive care. She and his father were on a Jerusalem city bus when two Palestinians attacked with knives and a gun last week. Haim's father was killed. "He was shot," Haim said of his father. "My mom was shot also, in her elbow and her chest. And she told me she tried to find the cell phone of my father. Tried to call to the police. And she told us it was obvious for her that dad wouldn't make it." It was difficult for Haim to tell his 11-year-old daughter how her grandfather had died. "She asked, 'Why? Why did they do this?' So I didn't have any answer," he says, choking up. Haim's parents came to Israel when they were young, Jewish immigrants from Iraq. Haim says they worked hard, his dad as a builder; his mom raising kids and cleaning other people's homes. Haim works for Intel, with Arab colleagues. His parents never taught him Arabic, although it was their native tongue. "They told us, 'You are here in Israel. Your language is Hebrew, and there is no need to know Arabic,'" he recalls. "You know, it's a pity. Because we know that parts of the Arabs, they don't like us. But we are here to stay. And we don't want them to go. We want to live with them in peace." So does Noam Tzion. Palestinians have carried out two attacks within a mile of his home. Now he looks warily at every Arab on the street. Tzion puts these attacks into a wider context. He used to believe that Israelis and Palestinians shared enough to negotiate an agreement satisfactory to both. "What I changed my mind about is I don't think that the issues that we have in Israel between Jews and Arabs are the result of a national conflict between Jewish nationality and Palestinian nationality," he said. "I think the issues today are defined by radical Islam. And with radical Islam, there is no possibility of a solution of any kind." Palestinian Authority officials blame the lack of a peace process on Israeli policies. The same policies they say that have pushed young Palestinians to carry out these attacks. The original on-air and online versions of this story mischaracterized the Western Wall as the holiest site in Judaism. It is the holiest site for Jewish prayer, while the adjacent Temple Mount is considered the holiest site.